June, 2011 | H&R Group K.K. Japan is a fantastically convenient country for public transport, and it is very possible to survive your whole life without a car or a driver’s license. However, when you want to venture out in to the countryside, or if you have kids that need driving to the pediatrician, a car will make your life much easier! You can use an international drivers license for up to one year after your arrival in Japan, after this you must apply for a Japanese driver’s license. Signs for destinations are blue for regular roads, and green for highways (see this picture for an example of a sign which indicates some regular roads, as well as one highway on-ramp). If you are ever looking for an on-ramp, just look for the green signs, and take some cash with you as the highways are quite expensive! For those who travel on the highway a lot, there is an ETC (Electronic Toll Collection) system that when installed in your car and used in conjunction with a special credit card allows cars to pass seamlessly through a special gate, saving valuable commuting time. Using the ETC system also makes you eligible for any discounts available (eg. late night discount). 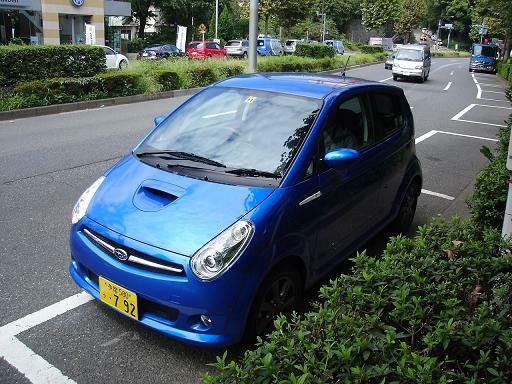 To buy a car in Japan, you must be able to prove that you have a parking space reserved for that car. The exception to this rule in some towns is the kei-car, or light automobile, which are indicated by a yellow license plate. If you are in Japan for a limited time, then leasing a car might be a cost-friendly alternative with no large upfront payment. This option also skirts around all the hassle of having to register the car, the car-inspection (shaken), arrangement of voluntary insurance, proof of parking spot, and selling the car when you go home. Not only this, but the car is maintained for you by the lease company so literally, you are just adding gas! Japanese drivers are both polite and aggressive. By this we mean that there are so many drivers on the road that it is seen as necessary to sometimes be a little pushy in order to get where you are going. However, when you do cut in front of someone, it is customary to bow your head slightly at them and raise your hand to indicate that this is what you would like to do. Then, having been given permission to cut in, flash your hazard lights as a way of saying thank you! In a Japanese car park, try to reverse park except in situations where all other cars are parked forward for some reason. The reason for this is that Japanese car parks are quite a lot tighter than those in other countries, and sometimes you will find yourself stuck and unable to back out of a space you’ve parked in. If this is a problem for you, it’s better to plan to park in a relatively deserted part of the car park to give yourself less chance of being parked in. This allows you to obtain a Japanese license and drive the same kind of vehicles that you are permitted to drive in you own home country. You may or may not need to take a written and practical test depending on the origin of your license. People with licenses issued from the following countries are not required to take a written or road test to convert their home country issued license into a Japanese licenses: Austria, Belgium, Denmark, Finland, France, Germany, Greece, Iceland, Ireland, Italy, Luxembourg, Norway, Portugal, Spain, Sweden, Switzerland, The Netherlands, United Kingdom, Australia, New Zealand, Canada, and South Korea. Conversely, people whose license was issued in the U.S., South Africa, China and Brazil are required to take both a written and road test, as are those whose license was issued in Africa, Asia, South America, Eastern Europe and Russia. Generally speaking, Japanese driving licences are valid for three years, but with good behavior it is possible to get a “gold” license from the second renewal which will last for five. Every time you incur a traffic offense (even parking), to get your license renewed the next time you will have to attend a safety class, and you won’t be offered the gold license! Road Rules – Swatting for your test if you have one! If you have a written test as part of your license conversion process (or even if you don’t), you’ll need to know the rules of the Road. Japandriverslicense.com has a list of road signs and their meanings in English, and other rules of the road can be found in a comprehensive JAF guidebook published in five languages (English, Spanish, Portugese, Chinese, Hangul). If you are taking the road test as well, this may not be enough to pass you the first time as you may be failed on minor technicalities that have little to do with your actual driving ability. For a full lowdown on what to expect, www.japandriverslicence.com offers a wide range of services to help you pass that test the first time! One word of warning about the tests, both the written and the practical. Be aware that if you fail to prepare for the test, you are preparing to fail the test, at least once if not more times. Even if you are a good driver, there are minor points that can trip you up if you don’t know about them ahead of time. Each time you fail the test you need to make an appointment to take the test again, so be advised to apply early! Give yourself lots of time before your international license runs out, because driving in Japan without a proper license is a serious crime. In the end, when you take into account the time you have to take off work to re-take the test, it is better to have someone train you properly to pass the first time. Many people fail to take the test seriously, and have a long list of failed tests to prove it. A driving school (jidohsha gakko) will take you through everything you need to know about motoring in Japan: the rules of the road, first aid, basic car maintenance, highway driving, map navigation, and of course safety driving. Instruction is divided into, for example, 26 lectures and 30-34 driving skills lessons. Lectures are in Japanese only, but an English translation of the text book may be available. Many driving schools boast extensive shuttle bus services and child care facilities. The driving skills exam is administered by the school and only a written test is administered by the driving test center. The whole package costs around 300,000 Yen. Free trial lessons are usually available as well. There are several large driving schools that offer a variety of courses and free shuttle bus services to neighbouring districts. To find out the availability of English language instruction or text books, please e-mail, or have a Japanese friend phone ahead for you. Koyama Driving School, who have 4 branches around the Kanto region, Setagaya-ku, Nerima-ku and Higashimurayama City in Tokyo as well as Kohoku-ku in Yokohama. Always have with you the phone number of a Japanese friend or colleague, or your 24 Hour Helpline consultant (if you are a client of the H&R Group and subscribe to this service) to help you in the case you have an accident. Even small incidents are very distressing in a country where you don’t understand the language, so don’t add to your stress by not having the right help. Lease Japan can offer English language car insurance assistance. JAF membership is a great idea for anyone in Japan with a car. You can call their roadside service any hour of the day if you have a flat tyre, flat battery or even if you’ve just locked your keys in the car. There is a registration fee of 2000 yen and a yearly fee of 4000 yen. They also have for sale, a comprehensive guidebook in English (as well as four other languages) on Traffic Rules and Regulations in Japan. Getting where you are going is a lot easier when you have a good map, and what better map than an up-to-date navigation system that drives along with you. They come already built in to the car, or as an added-on option. There is an English system also available. If you have a Japanese navigation system already installed in the car, then the easiest way to program it is by telephone number. Many home phone numbers will not be listed, but one trick is to use the phone number of a nearby business in order to guide you (or to guide friends with a navigation system to your house). Depending on how long you will be in Japan and what kind of car you want to drive, it can prove to be economical to lease. Leasing negates the need to try to sell the car when you go home, it also means that a lot of the fine details like insurance, registration and maintenance are taken care of. Lease Japan is a car lease company for ex-pats and is part of a large group of companies with over 20 years experience with the ex-pat community. No guarantor or deposit is required. Leases are available for any term of 6 months or longer for virtually any kind of new or used car on the market. All leases include full insurance (with no excess on claims), free maintenance checks, registration, free road-side assistance, 24 hour English Help line support, ETC and English or Japanese GPS Navigation systems. They can also supply ETC cards (without the need for a credit card application, which is a major part of the usual ETC process). Lease Japan can also help you to purchase or sell a car if that’s the way you want to go, and they also help with short-term car rental as well.